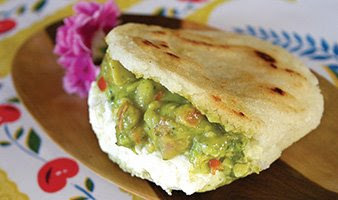 Arepas (pronounced uh-REY-puhs) are like little pancakes made of cornmeal, that can be stuffed with anything delicious: chicken, avocado, beef, cheese, plantain. Or eat them plain, topped with butter and salt. 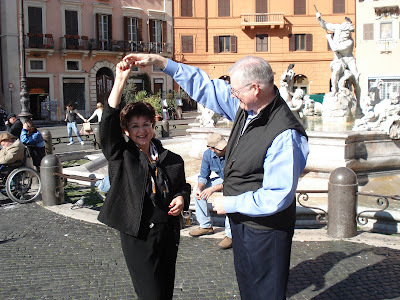 My father is big, white man from New Jersey, and my mother is a little, spicy woman from Colombia. (see picture below) Growing up, Saturday mornings consisted of my dad making french toast and my mother making arepas. Arepas are relatively simple to make. They do take a little elbow grease and time, because of the rolling and slow fry time. The main ingredient is masa (mah-sah) which is cornmeal. If you live in Texas, you can buy this at your local Fiesta. In New York, your local C-Town-Town will have sacks of masa/mararepa/maseca. 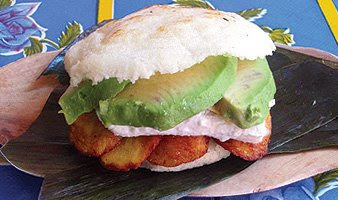 If you live anywhere close to New York, make a date to visit Caracas Arepa Bar on the corner of 1st Ave. and 7th Street. It is a hole-in-the-wall, sent straight from heaven. Arepas 1. Mix equal parts masa and water. (2 cups of each will make about 10 arepas.) You should be able to make cohesive balls of dough, that aren't too runny, but very moist. Add a few pinches of salt to dough. 2. Roll dough inbetween your palms to make 2 inch(ish) balls of dough, and then flatten to make disk shapes. 3. Heat oil over medium heat in a flat pan. Fry arepas 7(ish) minutes on each side. (if you are cooking for a large group, you can put several on a cookie sheet and keep warm in the oven.) 4. Serve any way you see fit: spread butter on top and salt, slice open and stuff with guacamole or fresh mozzarella and tomatoes. Get creative. You can't go wrong.